For National Volunteer Week, we are featuring one of our corporate partners, Google Fiber. The Google Fiber team has participated in two Tech-Teach-In (TTI) events in Austin over the past year, delivering their expertise to over 50 seniors in the community. 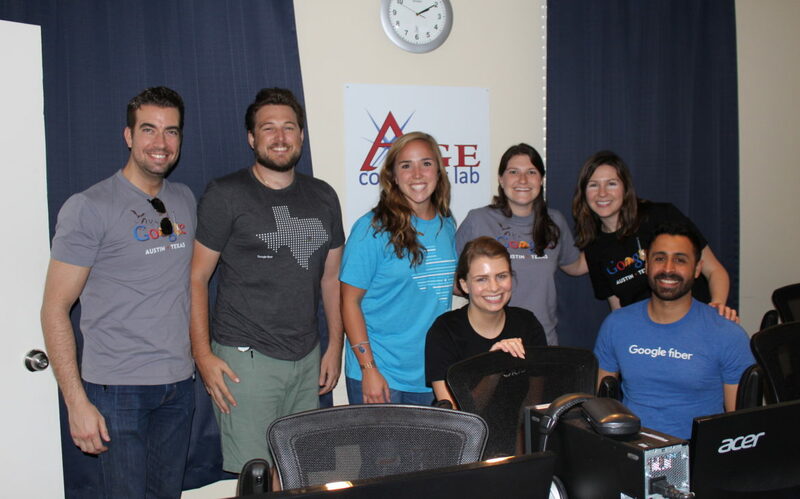 During the nationwide Digital Inclusion Week (May 7–11, 2018) Google Fiber volunteers provided digital literacy training for older adults at AGE of Central Texas. During this workshop, Google Fiber volunteers helped 20 seniors learn how to use Google tools, including Google docs, calendars, and Gmail. These tools can help seniors better connect with family and friends, keep up with their schedules, and more. In August 2018, eight Google Fiber volunteers joined CTN staff for their weekly Connect @ Home program to provide BYOD (bring your own device) training to 33 seniors at the RBJ center, one of the seven Family Eldercare locations where CTN provides digital literacy training. CTN looks forward to future volunteer opportunities with Google Fiber this year.